$270 for the simple canopy rail. $550 for a very detailed rail. 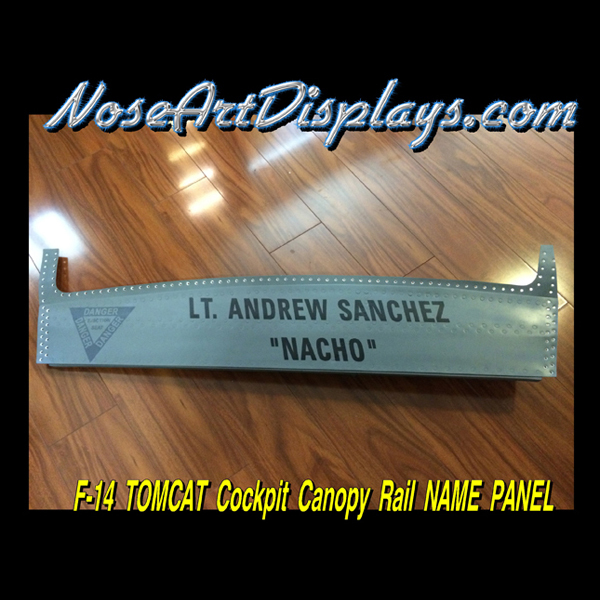 You are looking at a fully customizable F-14 TOMCAT Cockpit Canopy NAME RAIL. I can paint any RANK, NAME, CALL-SIGN and COLOR combination you desire. This is the standard version, there is a more detailed back-side version available. Made from .040 5052 Aircraft Aluminum, measuring 48″ long, 12″ tall and 4″ thick. The rail is complete with proper Longerons as well as a Former with over 190 solid flush aluminum rivets as well as 115 recessed rivet holes to represent the rivets that would have been drilled out to remove the panel. I am also very happy to discuss further customization of this product so that you are happy to display it on your wall or present it as a gift to a retired or current pilot. What would your call-sign be if you had been a pilot? Also check out my other auctions. Feel free to contact me regarding projects that I do not make… YET!